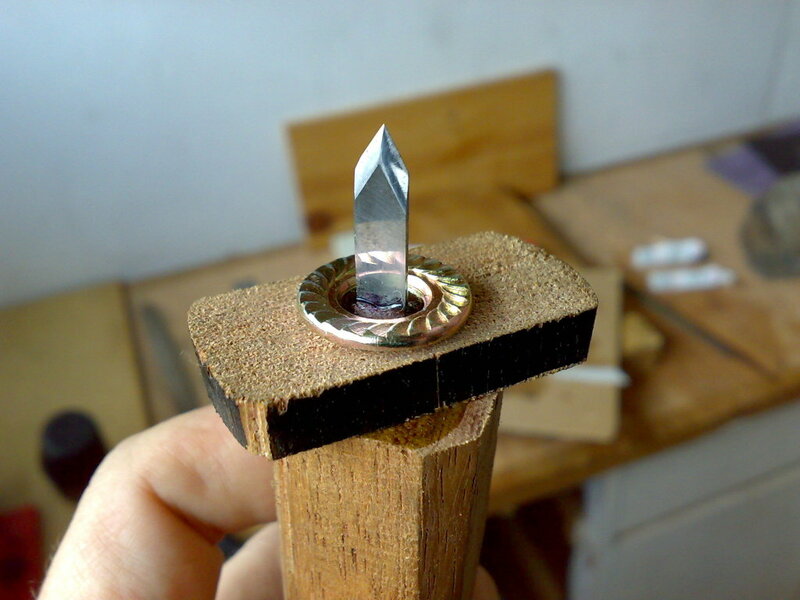 Marking Knife – Almost Done! So I had a good couple days in the shop before I packed it all up the other day. Besides doing the cushion frame for my friend, I did a lot of work on my marking knife. The first task was to get the blade satisfactory. 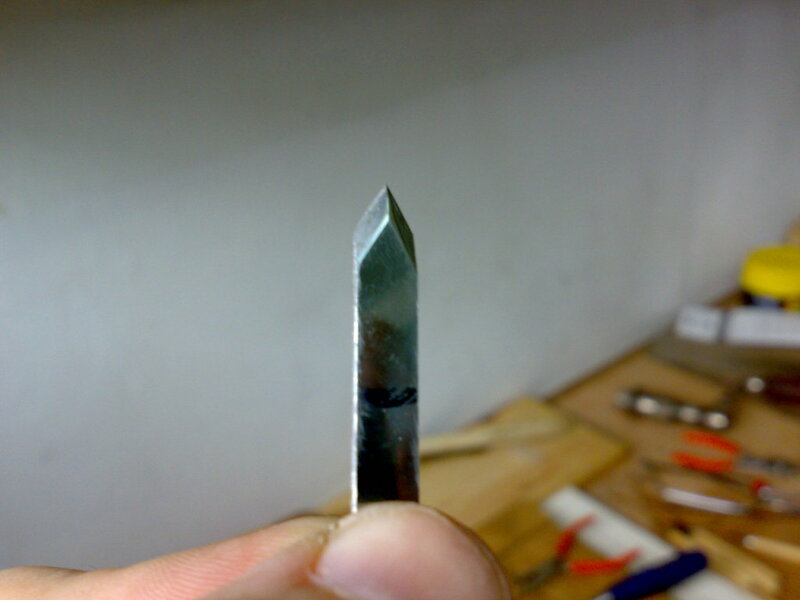 In the end, I did this by cutting a 30(ish)-degree bevel on a piece of scrap, and then filed the bevels of the blade along that angle. It’s not perfect, but it’s pretty good. I then honed the blade on my waterstones, which was a real bear with no honing jig. By the way, the blade is not discolored – that’s just me in the reflection! The black line is just to let me know how far in it’ll be mounted. Then I drilled a hole in the very center of the top (as best I could determine it) with my little dowel bit (for the tang), and hammered a few tiny nail holes in along the blade line to create a channel for the blade. Then I took my failed blade (first try) and drove it in spear-first to pave the way for the final blade. 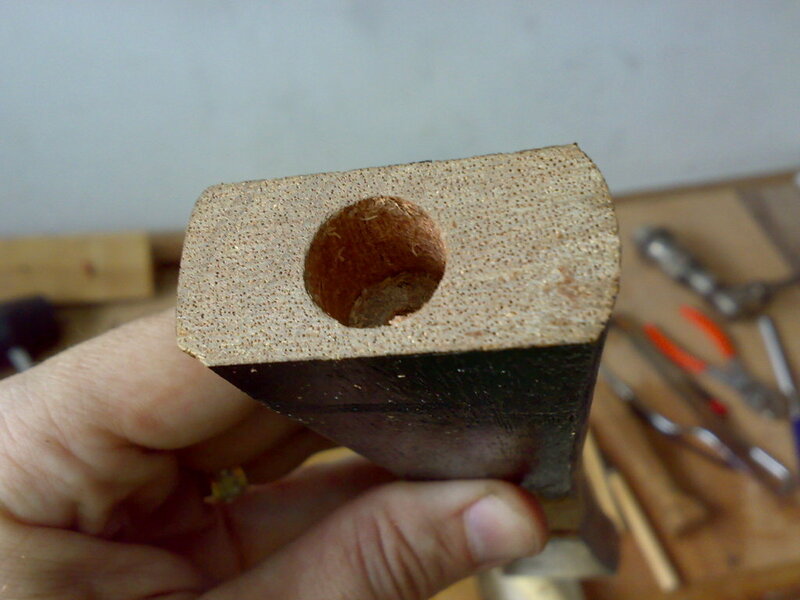 After that, I cut, trimmed and whittled the top down to the shape you see below. 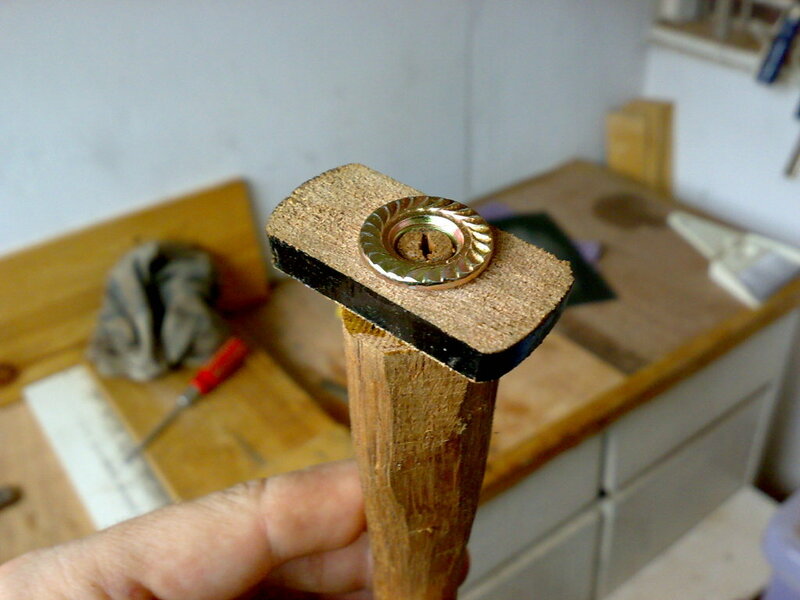 The ferrule is actually a flange nut, and as you can maybe see, I was able to carve some threads on the shaft by test-fitting the nut onto the handle. 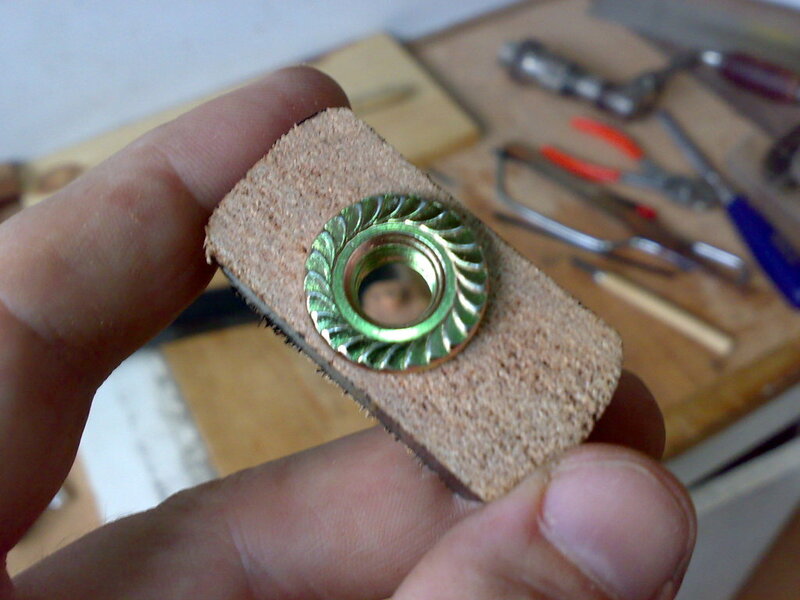 When that was done, I epoxied the nut into the sleeve and trimmed/sanded it so it was the exact depth of the nut. 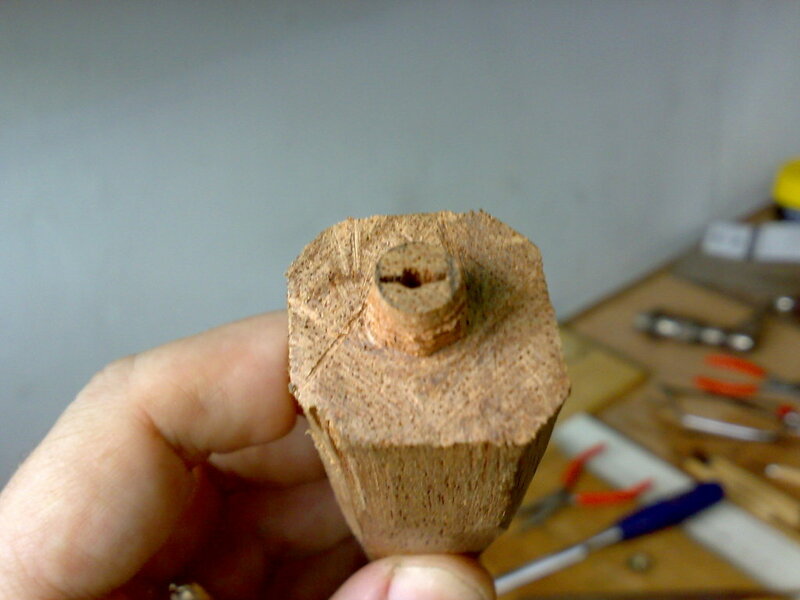 Then I glued and screwed the nut/sleeve onto the shaft of the handle. Finally, I mounted the blade! First I slathered epoxy on the tang and base. I then pushed it in as far as it would go with pliers (covered with cloth to protect my nice shiny polished blade). When I couldn’t go any further, I mounted the blade in my vise and pounded down with a mallet until I was at that black line I’d drawn. The knife is now wrapped in bubble wrap in my Box O’ Tools somewhere, getting ready to go on a little cruise. When I unpack it at our new home, I’ll whittle it down to its final shape. In retrospect, I really should have done the whittling first, and then mounted the blade. But I was just too excited. You know how it is. Mark why did you not turn it on your lathe? You can turn a brass or coper coupling for the ferrule also ? It’s never foolishness to save scrap wood. Now did I put all of it on the boat that crossed the South China Sea from the Malay peninsula to Borneo? No. But I did ship a good bit!